What is a rating system? 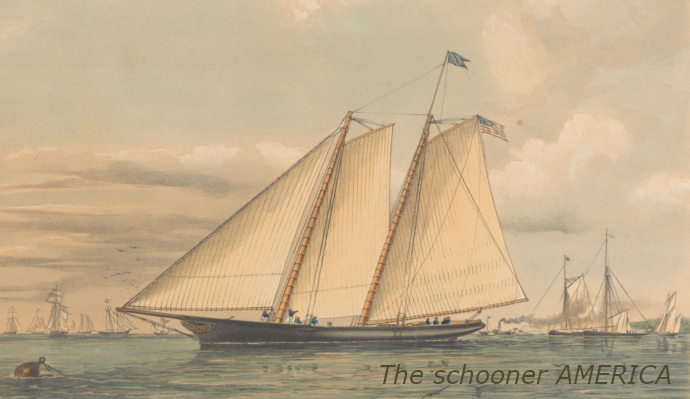 In 1851 the yacht America raced the British yacht Aurora around the Isle of Wight, and won by a country mile. This was hardly surprising: America was nearly twice the size. Ways to compensate for the natural advantages of bigger yachts have been sought ever since. Many systems have been tried, of varying degrees of complexity, but all are based on a number of fundamental physical principles. One of the most important, for displacement boats, is that maximum speed is limited by waterline length. This is because of the way that waves are formed around the hull as it moves through the water. It is hard to drive a boat beyond the point when there is a wave at the bow, and a second wave at the stern. This point – known as the "hull speed" – is reached at lower speeds for shorter boats. The ease with which a boat can be driven to its hull speed depends upon the surface area of the hull, rudder and keel (the "wetted surface"), its weight (displacement) and the sail area. There are many other factors which affect boat performance but these are the key elements, with wetted surface tending to govern performance in light winds, displacement governing strong wind performance, and sail area representing the amount of driving power available. All rating systems are based on finding ways to measure and represent these factors numerically, and combine them mathematically to compensate for the advantages and disadvantages of different designs. Modern rating systems generally all represent potential performance – the boat's rating – as a "Time Correction Coefficient" (TCC). This is usually a number with three decimal places either a little larger or smaller than 1. All that skippers need do is record their finish time, and multiply the elapsed time in the race by their rating (TCC) to get a corrected time. An effective rating system does only one thing: it compensates for the performance advantages of different types of boat. Short, heavy boats with small sails will naturally be slower than long, light boats with large sails. So the short, heavy boat will have a lower rating (TCC) than the long, light boat (under VPRS, Aurora would have beaten America with ease). How they actually perform in a race still depends on the crews: the boat with sufficient, well-organised crew and a skipper who makes good tactical decisions will beat a disorganised, badly-helmed boat every time. Consider a one-design fleet. No boat has a natural advantage, because within reasonable limits they are all the same. But although they may all start together, they are usually widely separated at the finish: the best crews cross the line well ahead of those which are not so good. The aim of a rating system is to make a mixed fleet of boats behave as if it were a one-design fleet. The best crew will usually win. Handicapping systems are different. In the game of golf, for example, the players can be likened to the crews in a one-design fleet of boats. The course is the same and the equipment is effectively identical. Whilst the good golfers complete the course in a smaller number of shots than those with a lower level of skill, the handicaps allow all the players to compete on equal terms. The handicap gives an indication of each player's average performance. Strictly speaking, a yacht handicapping system should do something similar. However, yacht handicap systems often combine elements of golfing-style handicaps with something akin to a rating system. In the National Handicap for Cruisers (NHC), for example, each yacht has a base TCC (which in effect is a rating) which is then modified during the season by actual race results—which are affected more by crew performance than boat performance. After a few races the handicap reflects the actual performance of boat+crew on the water. The aim of a handicap system is to give every boat in a mixed fleet an equal chance of winning. This might be acceptable if that is what everyone in the race wants. But unfortunately it tends to penalise people who try hard, and for many this doesn't feel right: we are generally more comfortable with systems that reward effort. Furthermore it is all too easy to exploit the system by changing crew for important races. A fairly applied handicap system should not allow changes to the crew (or the boat), but this could be rather limiting for club racing. The down side of a rating system, it should be said, is that the best crews keep on winning. This can be disheartening for a boat that isn't able (for whatever reason) to devote the same amount of effort to racing. A way forward could be to make a clear distinction between the rating (which applies to the boat) and the handicap which applies to the crew. However, that is outside the scope of VPRS, which is strictly a rating system. A VPRS rating does, however, provide an excellent base number for a handicap system if desired. It should also be said that no rating system is perfect: reducing the performance of a boat to a single TCC is a tall order, and in practice we find that different designs sometimes over- or under-perform, depending on conditions. There are ways around this, but all depend upon increasing complexity and expense. Within certain limits, however, a well-designed rating system works pretty well. VPRS was originally created for club racers sailing out of Poole Harbour who were dissatisfied with the existing systems: the costs associated with IRC discouraged many, whilst the local "Poole Harbour Handicap System" (PHHS) was not working well. In fact, PHHS was not a handicap system at all, but a rating system that could not handle the very wide range of boats racing in Poole Harbour. Consequently it depended on a system of "allowances" which, with hindsight, could not be disentangled from crew performance; nor could the allowances be applied consistently. So, was it possible to design a replacement for PHHS that would have wide appeal? It was clear that Poole wanted an alternative rating system, not a handicap. It was also clear that any new system needed to be affordable and easy to use. There was no effective way to modify PHHS, which was based on the old International Offshore Rule (IOR). It was apparent that a velocity prediction programme (VPP) could provide a solution as it would have the potential to accommodate a diverse fleet. The real challenge was to create one that worked using a conventional set of measurements, alleviating the need for a complete set of hull lines for each boat. Research and development for VPRS commenced in 2008. Following a trial by the Poole Yacht Racing Association (PYRA) in 2010, VPRS worked so well that it was adopted not just in place of PHHS, but IRC as well. Adopting a single system increased class sizes and removed artificial class boundaries. Scoring was simplified and better classes made the racing much more appealing. Other clubs in Poole started using VPRS and organising competitions between clubs became easier. Today the vast majority of boats in Poole use VPRS. Interest has steadily spread and VPRS is now used in Chichester, The Solent, Weymouth, Plymouth and in Europe and South America. ... then have a look at the apply page which explains how to make an application and gives contact, pricing and payment information. The measurement page provides all the material needed to complete an application. As well as the written guide, there are pdf diagrams to help with the measurements - and there are pdf and Excel application forms. Finally, if you keep your boat in Poole Harbour and would like to race along the coast and offshore then you could join PYRA, as the rating certificates are provided free with full membership.